Teddy Bear Turkey & Cheese Sandwich! 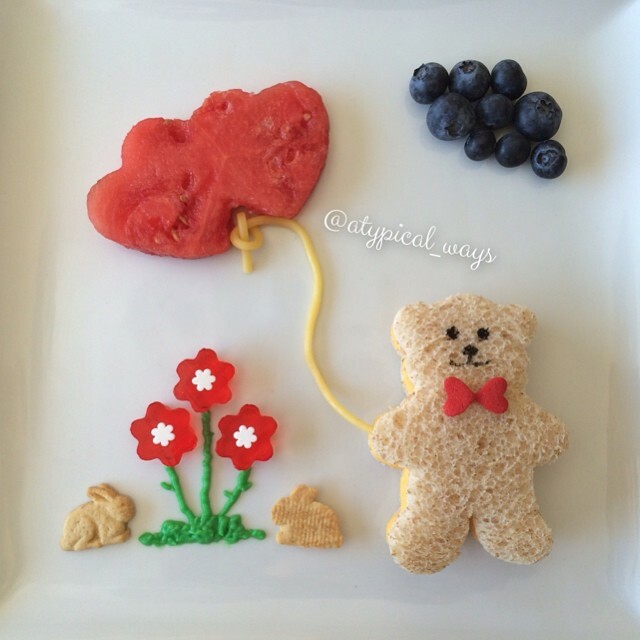 The teddy bear was cut with a teddy bear shaped cookie cutter and has a bowtie made of 2 heart shaped candies. I used a little black food coloring for his face. The balloons are watermelon that was cut with a cookie cutter and I used a candy strip for the string. The flowers are strawberry Jell-O with a white flower sprinkle cut with a small cookie cutter. The stems are vanilla pudding with green food coloring and the bunnies are Annie’s Bunny Grahams.